This is the official name of the free software design tool described in my previous posts Interactive Trees in Blogs Using SVG and More on SVG Family Trees. This post announces some important changes for the v5.0 release. There has been a Facebook group for this tool for some time now, called "SVG Family-Tree Generator". The membership is significant but comparatively low for a free tool with substantial functionality. One of the reasons is probably that the tool included too many configuration options for the casual user, and not enough stuff "out of the box". This has changed for this version, and some of the new features are described below. Just download all the files into a local directory, say on your desktop or in your documents area, and read the 'SVG Installation.pdf' document. It was always difficult to find the right magic spell to get the family trees to display with the correct size, position, and features, in all page situations. This version has made huge leaps there and it is recommended that previous subscribers rerun their tree definition files (*.txt) through the latest version to take advantage of the improvements. The documentation was always a bit lax about which modifier keys (e.g. Shift) could be used with mouse clicks in the final browser output, and what function they each achieved. In order to help users of different browsers (especially Internet Explorer), and Mac users, a practical default usage is now documented, although new options will support reconfiguration if anyone has a need to match the conventions of some existing Web page. Since this tool was originally designed for my own use, and for representing lineage situations in narrative research articles as opposed to conclusions in someone's database, then I had no need of GEDCOM support. 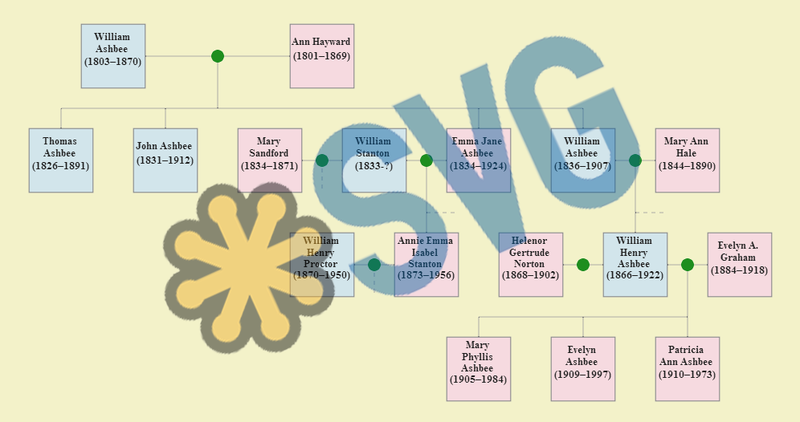 After much thinking, I finally decided to implement a GEDCOM Loader native to the SVG Family-Tree Generator. You can now select GEDCOM files from disk, browse their contents, and copy-and-paste persons or families directly into the Tree Designer window. You can also convert whole GEDCOM files if you wish. 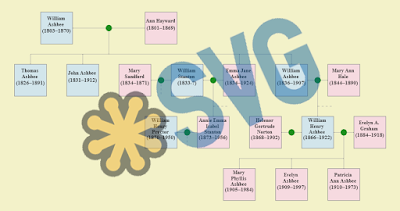 This copying or conversion of the data to SVG Family-Tree Generator includes the automatic generation of captions, tooltips (i.e. "hover text"), biographical notes, life events of many types, and the special HTML mark-up required for its Timeline support. So what does this mean in practice? Well, if you converted a GEDCOM file directly to a *.txt tree definition file, and then generated the usual HTML output using this tool, it would immediately include all the major features such as pop-up biographical information panels, hover text, controls to pan or zoom one tree at a time (rather than a whole Web page), and timeline reports. This is all "out of the box", with no programming involved. As a demonstration of these features — all of which could be used to display your own trees in subscription-free Web pages, or blog posts, for your family to access — a version of the existing Timeline Demo is embedded in this article. Shift+Click (or Alt+Click in most browsers) will select a specific person-box, or a family-circle (which then selects the two spouses and all their direct children). The 'Plus' icons in the person-boxes will also do the same as the Shift+Click operations. The 'Eye' icons will expand any thumbnail image in the person-box. The 'Select All' button selects all person-boxes and all family-circles. The 'Show' button collects the timeline events for the selected items, sorts them, and displays them in a timeline report. The 'Dismiss' button closes the report. The 'Clear' button clears all the selected items. Pop-up information panels, giving the full biographical details, appear by clicking on the respective person-box or family-circle, and these can be dismissed by Ctrl+Click (or CMD+Click on a Mac) on any person-box or family-circle, as appropriate. Note that clicking on a green event description in the timeline report will also show the corresponding information panel containing that event. As can be seen, the timeline reports can either take events from a specific tree or from multiple trees, and this can be useful when trying to correlate different histories. Buried 2 Jan 1756 at Coddington All saints. Mary died in 1735, the same year as her infant son (John). James was born c1726 and buried 1 Aug 1726 at Coddington All Saints. Baptised 19 Jul 1730 at Coddington All Saints. Married Mary Bowman 27 Jul 1756 at Coddington All Saints. Mary died 1805 aged 74 and buried 12 Feb 1805 at Coddington All Saints. Baptised 10 Sep 1732 at Coddington All Saints. Baptised 13 Apr 1735 at Coddington All Saints. Buried 18 Dec 1735 at Coddington All Saints. Baptised 17 Sep 1727 at Coddington All Saints. Buried 10 Oct 1789 at Coddington All Saints. Buried 26 May 1772 at Coddington All Saints. d. 1783, aged 52, of "Distemper fever" and was buried 1 Feb 1783 at Coddington All Saints. Baptised 4 Jul 1743 in Long Bennington, Lincs. Buried 11 Nov 1824 at Coddington All Saints. Born 28 Sep 1784 in Coddington. Baptised on 10 Oct 1784 at Coddington All Saints. Died 1869, aged 92, and was buried at Woodborough St. Swithun on 13 Oct 1869. Baptised 14 Feb 1782 at Lowdham St. Mary The Virgin. Buried 4 Jan 1850 at Bingham St. Mary and All Saints. Baptised 26 Aug 1753 at Coddington All Saints. Baptised 5 Feb 1755 at Orston St. Mary. First wife (Elizabeth) died 1798, aged 40, of "a lingering consumption" and was buried 17 Jul 1798 at Coddington All Saints. Married Elizabeth Watson (b. c1758) 24 Dec 1798 at Coddington All Saints. Buried 9 Jul 1815 at Coddington All Saints. Baptised 14 Nov 1756 at Coddington All Saints. Married Elizabeth Whaite 3 Jul 1787 at Barnby-in-the-Willow All Saints. Died 1834 aged 76 and buried 16 Dec 1834 at Coddington All Saints. Baptised 1 Oct 1758 at Coddington All Saints. Baptised 2 Mar 1760 at Coddington All Saints. Baptised 25 Apr 1762 at Coddington All Saints. Baptised 11 Sep 1763 at Coddington All Saints. Baptised 24 Mar 1765 at Coddington All Saints. Died 1841 aged 76 and buried 27 Jul 1841 at Coddington All Saints. Baptised 1 May 1768 at Coddington All Saints. Buried 28 Dec 1769 at Coddington All Saints. Baptised 29 Apr 1770 at Coddington All Saints. Married 6 Feb 1726 at Averham St. Michael & All Angels. Married 27 Nov 1738 in Long Bennington, Lincs. Married 15 Jun 1735 at Coddington All Saints. Married 19 Aug 1751 at Newark St. Mary Magdalene. Married 25 Aug 1766 at Coddington All Saints. Married on 18 Mar 1775 at Coddington All Saints. Married on 22 Jul 1784 at Coddington All Saints. Married 9 Feb 1803 at Screveton St. Wilfrid. Thomas was a POW in Napoleonic France until 1814, while Margaret took up with a Thomas Meads in Epperstone. b. 1833 in Nottingham; Bpt: 20 Jan 1833 at St. Mary's, Nottingham. d. 1910 in Nottingham aged 77. Bur: Church Cemetery, Nottingham., common grave 8123 in St Ann's Valley, on 24 May 1910.
b. 1834 in Maidstone, Kent. d. 1905 in Nottingham. b. c1833 in Bishops Cleeve, Gloucestershire. Licensed victualler at Worcester Arms, Worcester St, Cheltenham. d. 1883 in Cheltenham. b. 1834 in Tetbury, Gloucestershire. d. 22 Apr 1924 at 59 Norland Rd, Nottingham. b. 21 Apr 1870 in Nottingham. d. 12 Dec 1950 aged 80. Addr: 33 Young St. Bur: 15 Dec 1950 at Wilford Hill. Gr: G34/51. b. 1873 in Cheltenham, Gloucestershire. d. 10 Jun 1956 in Nottingham. Bur: 13 Jun 1956 at Wilford Hill. Gr: G34/51. Married 2 Oct 1858 at Nottingham St Nicholas. Married 21 Nov 1872 at Gloucester St Catharine. Married 29 Nov 1891 at Nottingham Emmanuel. The documentation was getting a bit weighty so it has now been split into a proper User Guide ('SVG User Guide.pdf') and a more in-depth set of program notes for people who want to get under the hood ('SVG Utility.pdf'). Independent researcher and writer Graduated in physics but entered computing in late 1970's. Software architect since 1987. Born in Nottingham but currently working from rural Ireland. Worked in areas of language compilers and associated tools (creating 3 proprietary language systems), computer architecture and operating system development, OLAP databases (registering 2 US patents), cross-platform portability, business intelligence, encryption, workflow, multi-tier distributed servers, locale systems and globalisation. Entered genealogy in about 2004. Still heavily researching the history of all branches of my family (i.e. many different surnames). Working independently on a research project for a universal source format for micro-history data (STEMMA, www.familyhistorydata.parallaxview.co/). Vice Chair and former Acting Chair of FHISO (http://fhiso.org/). Blog: http://parallax-viewpoint.blogspot.com/ Still researching fundamental physics and writing on the nature of time and reality. In particular on the reconciliation of quantum mechanics and reality with a block universe. Although the views expressed here may draw strongly from the STEMMA private R&D project, they do not represent the views of FHISO of which I am associated. This is a personal blog by a genealogist who strives to record micro-history rather than either family history or a mere family tree. Copyright ©. Articles licensed under a Creative Commons Attribution-NonCommercial 4.0 International License, unless explicitly stated otherwise. Being English, I make no apologies for using British-English spellings, punctuation, grammar, and style, including "Oxford commas", "logical quotes", and padded m-dashes. Copyright © 2018. Simple theme. Powered by Blogger.